Seeing all the posts featuring pumpkins made me remember a trip four years ago. 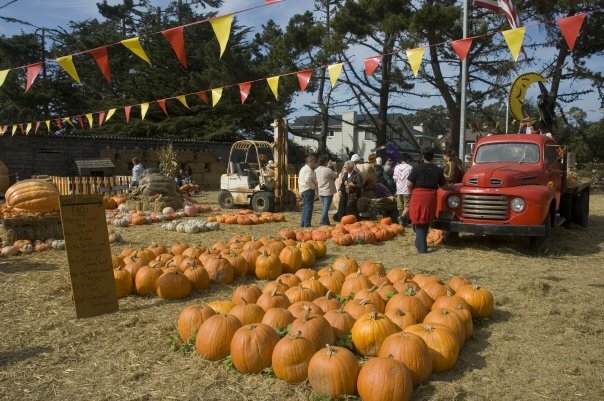 While driving along Half Moon Bay just off San Francisco, I stopped by this incredible roadside display of pumpkins, including really large ones that still amaze me to this day. Love the classic red truck. The week's done, chores complete, everything's ok. Nothing like a leisurely weekend afternoon. And to make it even better, have some Churros con Chocolate to complete the weekend. And there's one place to enjoy the best, the one that started it all forty-eight years ago. At Dulcinea, they still continue to make Churros the same way since 1963. A family gathering in the home of the Dude's aunt means one thing: magnificent Paella. And for as long as I remember, my aunt would call one person for this dish. My aunt's cousin in-law has mastered the art of Paella through the years, and now has a successful home-based operation. The most popular type of the traditional Paella is the mixed seafood version which includes crabs, large shrimps, mussels and squid, as well as chicken, pork, green beans, peppers and Spanish Chorizo de Bilbao. The halo-halo, that wonderful sweet concoction of local preserved fruits and sweet beans, never fails to entice and take you on a wild sugar rush. Literally translated as "mix-mix", the halo-halo is basically a cultural melting pot of influences and flavors in a tall glass. The different variations reflect Spanish, Chinese, Malay and American influences, with each ingredient contributing to make a simple yet indulgent dessert. The usual mix of ingredients include a combination of sweet preserved beans (mung, kidney and white beans), thin shreds of young coconut (macapuno) , jackfruit and plantains, nata de coco (coconut gelatin) and other preserved fruits. Filled with shaved ice, topped with leche flan (caramel custard), ube (purple yam) and ice cream, you'll need a real tall glass. Other ingredients include gulaman (colored gelatin cubes) and kaong (preserved sugar palm fruit). To complete the dessert, pour on some evaporated milk. sprinkle some pinipig (homemade rice crispies) and watch the ice cream melt and mix with the other ingredients. Interesting to note how most cuisines somehow evolve, get localized, and then slip into the cultural mainstream. True and authentic Chinese cuisine, sadly, can only be found in higher end establishments. But then again, the food at Mann Hann is both familiar and homey. They say the best way to really know a city is to visit the local market. See the local produce, see what the locals eat and breathe in the local vibe. 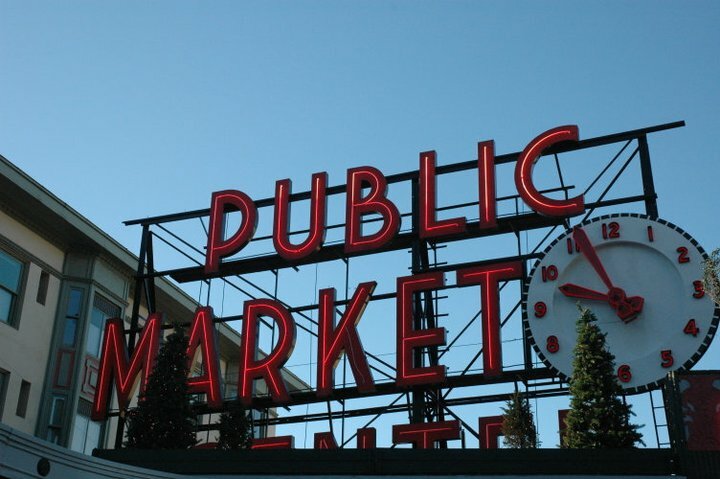 And Seattle's Pike Place Market is definitely an attraction you shouldn't miss. Be amazed with the wide and extensive varieties of local seafood, all caught fresh from the rich Pacific coast and Alaska. A traditional farmers' market, shoppers have the rare opportunity of getting up close with the local producer, farmer and fisherman. More than a hundred years old and still going strong, Pike Place Market is a great place to know the city of Seattle. Real good Japanese food used to be found only in premium establishments, and I was pleasantly surprised to find good Japanese food and value in one place. Konbini Tokyo Market is a Japanese style grocery/convenience store with a great little restaurant inside. The grocery section is also impressive. You can find premium Japanese coffee in both ground and whole beans, Instant and ready-to-drink cans, and a variety of snack items, as well as a nice meat section with Wagyu selections. Unlike other good small Japanese outlets like the ones you find in Little Tokyo in Makati, which also offers good authentic Japanese food but often appear old and dingy, Konbini is refreshingly clean and well-lit. And here's a great tip. If you're looking for the authentic KitKat chocolate wafer, and not the reformulated "tropicalized" version available in other mainstream local supermarkets, you can find the Japanese KitKat editions in Dark Chocolate, Green Tea and other variants right here at Konbini. Pricey at P 100.00 per bar, but you can really taste the difference. It does melt faster, but the rich chocolate flavor is way better than the usual KitKat. And they have one of the best deals with their Ramen and Gyoza Combo. The set meal of authentic Cha Siu Ramen plus a platter of Gyoza goes for P 335.00, not bad for a real Japanese noodle meal. The Cha Siu Ramen and Gyoza Meal Sets are available in three combos: Tonkotsu Ramen, Miso Ramen and Shoyu Ramen. According to the Konbini staff, the Tonkotsu Ramen set is their bestseller, and I decided to try that one. Nice to See You Again, Charlie's Grind & Grill! After trying out a low-fat, low-salt and no-fun diet for two weeks, I had my blood tests done and decided enough of the oatmeal and go for some serious burger and fries. I'll worry about the cholesterol results later, but tonight is burger time. Big time. And the nearest burger joint is Charlie's Grind and Grill along Ortigas Avenue toward Santolan. Black Angus Burger and thick country style fries...now that's what I'm talking about. Watching the various documentaries on TV on the tenth anniversary of 9-11, I somehow felt connected. Not that I witnessed the tragedy, but because of my admiration and respect for The City. I had a chance to visit NYC for the first time five years after 9-11 and one can't help but feel the city's tenacity and never give up attitude. I remember the immense pride among the locals for their city. And its many heroes during that tragic day. The home of New York's Finest, and the brave ordinary citizens who stood up against terrorism. The mood when I was there was upbeat and optimistic, but you can also sense that The City will never forget. Try to come in early to avoid the long lines. If you do have to queue up, don't worry, it's definitely worth the wait. Go check the window display featuring the fresh catch of the day. It's also conveniently located beside See's Candies. Perfect. 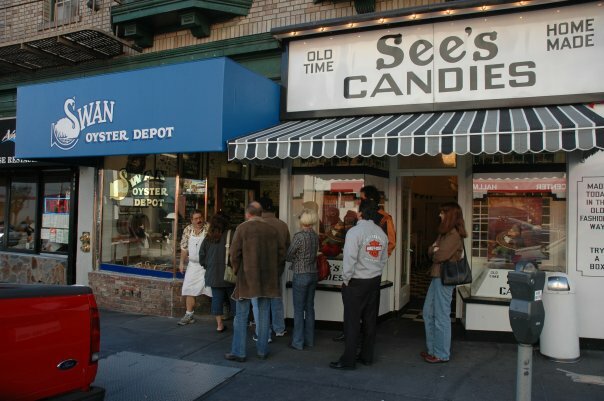 Sadly, I was told See's Candies already closed and moved to another location. The famous stuffed one pound burger at Hash-House A Go-Go, with double Midwest beef patties, and instead of the usual fries, a side of salad. Just had to compensate for the apple-smoked bacon. 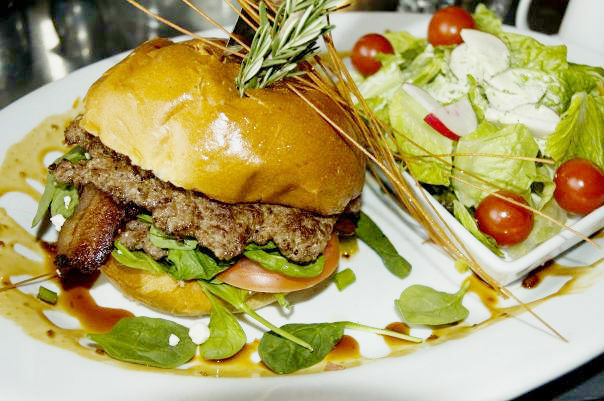 Best known for its hearty breakfast and brunch specialties and "twisted farm food" fare, the burger is also a stand-out. With the trademark sprig of rosemary stuck on the bun, something Hash House does in all its food, this is a serious burger. Just off the Strip at West Sahara, great place for huge and hearty breakfasts and loaded burgers. Great atmosphere as well, nice local vibe. If you want to get away from the clattering noise of the slots, and forget about the dollars you lost, this is the place. 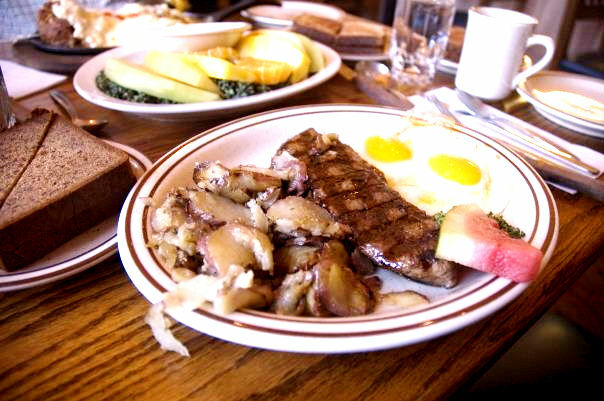 Steak and eggs with country style potatoes at Bright Angel Lodge, Grand Canyon. Starting the day right before the hitting the trails. Major protein and carbo loading. Filled with tourists, the overall atmosphere is warm and friendly. And the food's great. John, the friendly Korean owner of the establishment excitedly greets us, and tells us "We have elephant clams tonight. Very fresh. Very good. You try." Sure,why not. As we have our first round of brews, we wondered, what the hell are elephant clams? After a few minutes, the steamed mystery clams arrived. "It's very good." John exclaimed with pride and a smile. I downed my beer, picked up the clam, dunked it in the soy dipping sauce, and...hey, it is good. In fact, it is "very good" as John promised. Think shellfish on steroids, they are huge, even scary to make you drink a little faster. It's pretty much like your oversized mussel, same texture and flavor. We had a second round of brews to finish off the clams. Great way to start the meal.